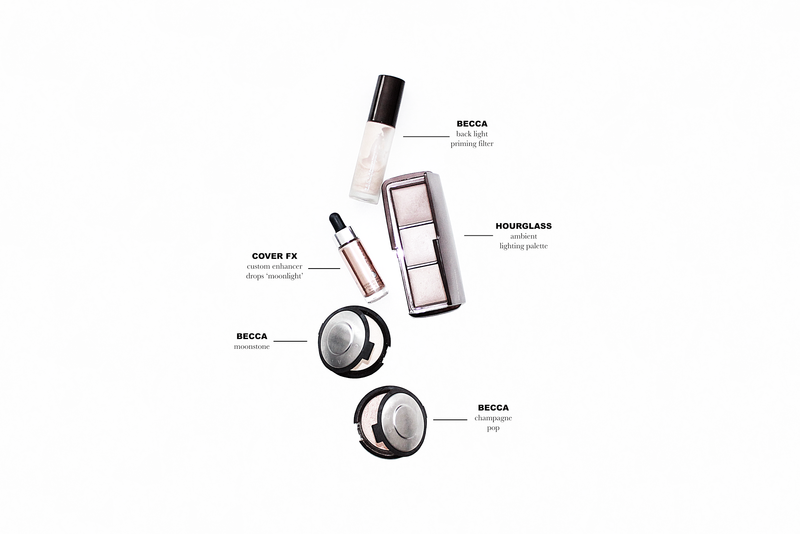 Becca Backlight Priming Filter : I find that a little goes a long way with this product and I tend to also use it sparingly as a second highlighter. I hit the tops of my cheeks and high points of my face post hydrating primer and pre foundation. I find that it helps to give just a bit of extra glow and "lit from within look". This is a product that you could go really heavy handed on however, and would get a whole lot of shimmer from. Hourglass Ambient Lighting Palette : This is the perfect palette for someone who is just dipping their toes into the highlighting world - or for someone who doesn't want to glow and be seen from outer space. (I personally love a highlight that can be seen from Mars though haha!) This palette is super subtle, very pretty, and also very versatile. I not only use it to highlight the high points of my face, but it can also be used as eyeshadow (which makes it perfect for travel). The formula of these give off a really gorgeous sheen, that doesn't carry a lot of shimmer. Cover FX Custom Enhancer Drops 'Moonlight' : Moving onto the highlight that can be seen from Mars category...the ever talked about Cover Fx Custom Enhancer Drops. As most people have mentioned, the best way to describe these is liquid metal. What I love most about these is how versatile they truly are. They can be amped up big time to create the ultimate glow, they can be sheered out and used as a gorgeous (yet more subtle) shimmer, and they can be added into foundation for extra glow. This is also my favorite formula to use on my shoulders and collar bone. I find that it doesn't move around like powders can. Becca Highlighter 'Moonstone' : My most used highlighter (aside from the Cover Fx) is Moonstone by Becca. It's the perfect neutral shade (not too golden, not too silver), definitely gives off a glow (more than the Hourglass palette), but doesn't scream too intense (like Champagne Pop can). This is also my favorite shade to use in my inner corner and my brow bone (even if I've used another product that day). Becca Highlighter 'Champagne Pop' : For a pressed powder that carries a punch, I always turn to Champagne Pop. I find that it gives just that extra bit of pop and glow and looks especially good with a tan. This shade is definitely more golden and can carry a bit of a peachy undertone - meaning I don't always grab for it like I might Moonstone. What are your favorite highlighters at the moment? Let me know what must have options I need to add to my Sephora cart!